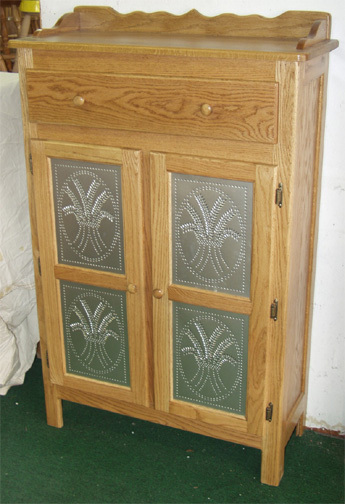 Another fine example of our beautiful Amish made solid-oak pantry cabinets and pie safes. This one features four decorative tins and a drawer on top. Our pie safes are available in a large variety of configurations, and we have had them custom built to exact specifications for several very satisfied customers. Ask us for what you need. We will be more than willing to make you a happy customer too! Also available with punched copper tins!